I’ve published a full in-depth, hand-on Review of the EinScan-SE and EinScan-SP! Yesterday I attended the grand opening of Shining 3D’s EMEA office in Stuttgart, Germany. With this big step the Chinese company also launched two new desktop structured light scanners. The $1199 EinScan-SE will replace the EinScan-S I reviewed last year while the $2299 EinScan-SP is positioned between the base model and the EinScan-Pro I also reviewed earlier. When I reviewed the EinScan-S my verdict was that I was naturally amazed by its very competitive price, but also the detailed scans the scanner could make. On the downside, I found the amount of cables — and especially the thick VGA cable — quite a hassle to set-up and operate. On top of that the included stand was to light for the top-heavy scanner head and could easily be moved accidentally, requiring re-calibration. Finally, at the time of the review the software was obviously underdeveloped in terms of stability and interface design. The Scanner head and turntable can now be attached to each other to create a very stable setup. The system uses just a single USB cable (supporting both USB 2.0 and 3.0 protocols) and a single power cable to operate. The plastic calibration board has been replaced with a sturdier metal (it could also be ceramic, not sure) version. To put that in perspective: you will have this scanner out of the box, fully connected and running within minutes — it’s really a plug-and-play device now. The specs are largely the same as the original: the accuracy is still 0.1mm and the scan volumes are the same at 20x20x20 cm for an automatic scan and 70x70x70 cm for a fixed scan without the turntable. For the latter, the scanner now features a standard tripod thread so you can mount it onto any tripod. What did change is the scanning speed. While the original EinScan-S could do a single scan in 10 seconds and a full 360° automatic scan in 3 minutes, those times have been cut to 8 seconds and 2 minutes respectively. The current software is at version 2.3 already. While I only did some quick hands-on testing at the event, it appears to be more streamlined and certainly has a better designed user interface. Shining 3D even spoke about a Mac version being in development, which will surely excite many creative professionals that want to take their first steps into high-detail 3D scanning at an affordable price — no more Boot Camp! Although I naturally have to do a full review to say anything about the actual workflow and quality, the results I’ve seen so far as impressive. Below is the result of the object above, scanned with the SE. As you can see it captured the horns pretty well and also shows some of the details on the saddle. 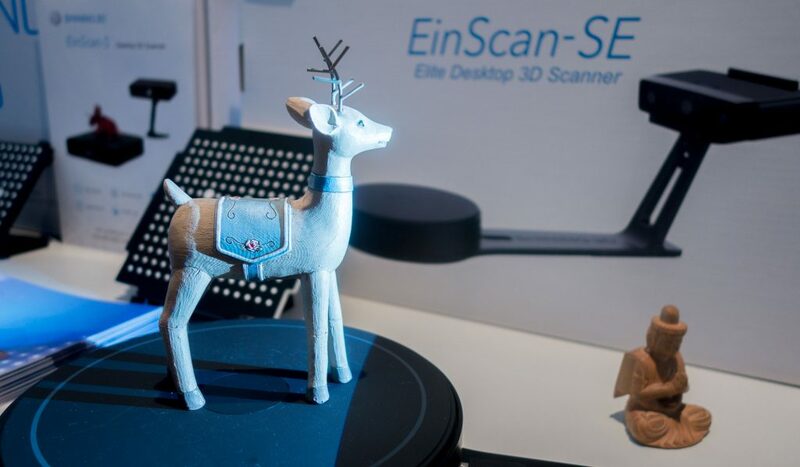 If you still want more accuracy beyond that, until now the only option at Shining 3D was upgrading to the EinScan-Pro, which is both a handheld scanner and a desktop scanner in one. But at a price difference of around $4000, that was still a big step for many. That’s where the EinScan-SP comes in. The EinScan-SP (P for Platinum) is positioned right in the middle between the SE and the Pro at $2299. And if you take a good look, you’ll notice a lot of similarities between the SP and the Pro. The scanner head itself looks like a miniature version of the silver-and-black Pro and the turntable has the same markings that offer automatic registration. This means that you don’t have to calibrate the setup very time the scan head moves, which makes the SP a more sensible choice if you want to use a tripod to scan objects in multiple cycles on the turntable from different angles. When reviewing the original model S (not the car) I found that his quickly becomes a necessity if you want to scan the top of objects taller than 10 centimeters. 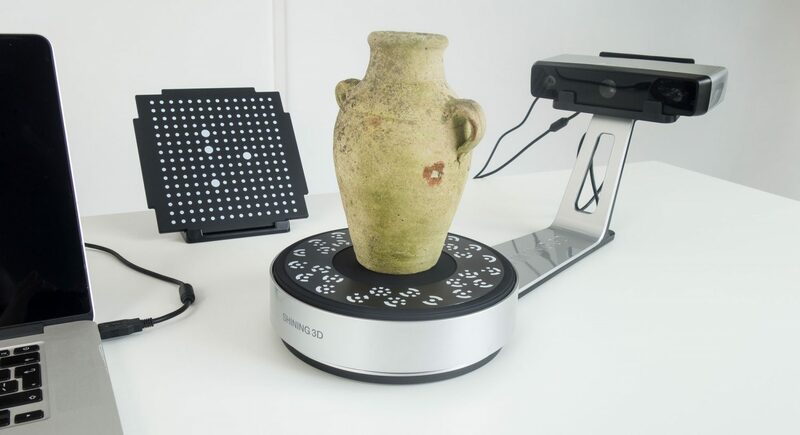 While the scanner should perform great without using tracker stickers on most objects, it’s good to know that the SP does offer this feature for scanning objects with less detailed surfaces. If you’re planning to scan solid technical parts, the stickers are good to have laying around (many are included). I’ve been told that the new software does a better job at removing the stickers from the scans than earlier versions. Apart from workflow differences, there SP is also more accurate than the SE (0.05mm instead of 0.1) and is twice as fast. A single scan takes just 4 seconds and a complete 360° automatic scan is completed in 1 minute — 3 times faster than the original EinScan-S! It’s noteworthy that SE/SP scans that are on the new EinScan website are all colorless. In the presentation, Shining 3D showed that only a small percentage of EinScan-S users actually use or need color scans. The amount was a lot higher for the EinScan-Pro, that’s used for purposes that more often require color textures. There’s something to be said for that but I can’t wait to find out how the color capture of the SE and SP compares to that of the original EinScan-S. I believe that color capture will become more important now that people aren’t just using 3D scanners for single-color 3D printing anymore but are also exploring realtime 3D visualization online and in VR/AR applications. As you can see the EinScan-SP is on my desk, ready to be reviewed. I also requested an SE because I’m hoping to be able to test them simultaneously to be able to answer the obvious question “which one should I buy”. Follow me on Twitter, Facebook or Instagram to be the first to know when the full hand-on reviews of the EinScan-SE and the EinScan-SP are live. Additionally, you can Subscribe to my Newsletter for a monthly digest of my blog. And yes, I will also test the EinScan-Pro+ in the near future.